Hey all! How are you this fine weekend? With Video Rage coming out in ten days, it’s time to do something I do every time I have a new book coming out: interview my characters. And who best to interview first than the protagonist, Zahara Bakur? After all, she was my first interviewee for Reborn City, so it makes sense that she would be the first for Video Rage as well. She’s also one of my favorite characters, which is even more reason for me to interview her first. Special Abilities/Powers: No special superpowers, but she is a prodigy when it comes to riding hoverbikes. Notes from the Author: In the first book, Zahara was very timid and unsure of herself. She was also very adverse to violence. She’s still very adverse to violence, but having survived several violent events, she’s better able to keep it together when there’s trouble. Add in the fact that she’s a natural hoverbike rider, and she’s gained some confidence. I think part of the fun of Zahara is that you do get to see her grow in confidence throughout the series, and that affects her role in the story. At first she’s scared often and usually gets relegated to the sidelines, but as time goes on she becomes braver and takes center stage more and more. That, if you ask me, is my favorite type of protagonist. RU: Hello again, Zahara. It’s been a while. ZB: You again! Where am I now? RU: Zahara, you left Reborn City a few weeks ago. Please tell us what’s happened to you since then. ZB: Well, we’ve been screwed over, that’s what! ZB: Well, sorry! I’m just upset, okay? Parthenon tried to have us all killed, and when their plans–and their building!–go kaboom, they turn us into terrorists! Just because I’m a Muslim, they make us into the new al-Qaida and send the whole world after us! Seriously! RU: Oh yeah, the world you live in isn’t exactly nice to Muslims, is it? ZB: No, it’s not. We thought before we could get to New York and find some safety, but with the whole “terrorist” label, that plan’s out. We’re just trying to find a safe place now. We don’t know where that is, so we’re just going, and hoping by the time we’ve put enough distance between us and Parthenon, we’ll know where a safe place is. RU: What are you guys doing to keep yourselves from getting caught? RU: I’ve noticed. It’s very nice. ZB: Thank you. Rip’s also changed his hair, he dyed it back to what he says was its original color. It looks very nice. And Owl wears sunglasses, and we’ve all stopped wearing black clothes, and we’ve even removed our tattoos! Those last two were huge giveaways, so they had to go. Still, it was a big deal for the other Hydras. The clothes and the tattoos were an important part of their identities. ZB: I may not have the tattoos or the clothes, but I’m hunted. I’m hated. And people expect the worse of me without even knowing me. I’m just like the other Hydras, in that way. And I’m with them till the end, good or bad. Inshaallah, it’ll be a good one. RU: I wish you the best of luck with that one. Well, that’s all for now. 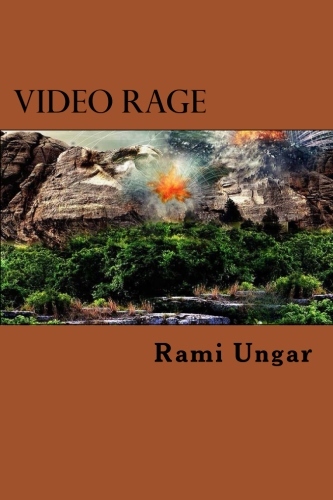 Remember, Video Rage will be available June 1st from Amazon, Barnes & Noble, iBooks, Smashwords, and Kobo. You can also get the first book, Reborn City, from those same sites. Join us next Sunday when we meet Rip again. I seriously hope he doesn’t try to kill me. He didn’t seem to like me the last time we met. But then again, if he does kill me, there goes the Anno Bombus universe, which means the end of his existence…and I’m thinking about this too much. I absolutely love those character interviews and I just noticed that I always forget Zahara’s age. Somehow I always imagine her 1 or 2 years older for some reason. She’s very mature, that’s why. And she’s skipped a couple of grades, so that contributes to the confusion. Could be it I guess. Wohoooooo!! Congrats 😀 and it was my pleasure!